I love Pottery Barn. I don’t always love the prices. 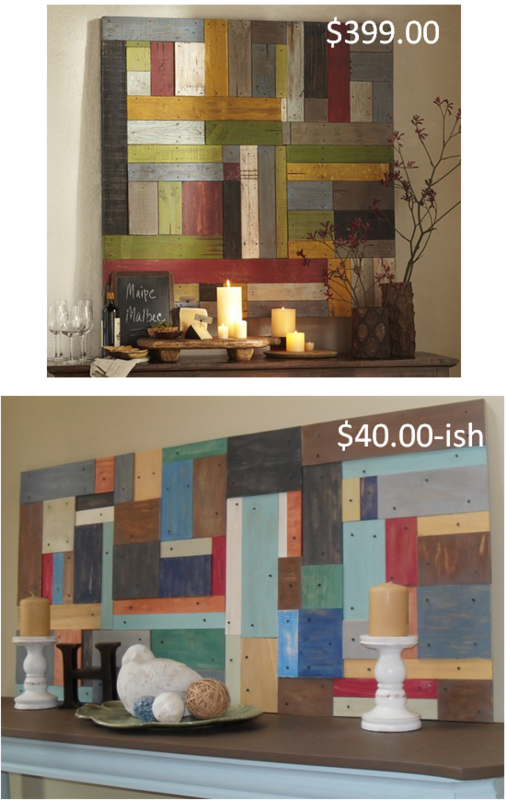 While flipping through the recent catalog I saw this rustic wood wall art. A whooping $399.00! Knowing I have a pile of scrap wood in the garage, I just about did the happy dance at the project I knew I was going to tackle. I love power tools. I love wood! 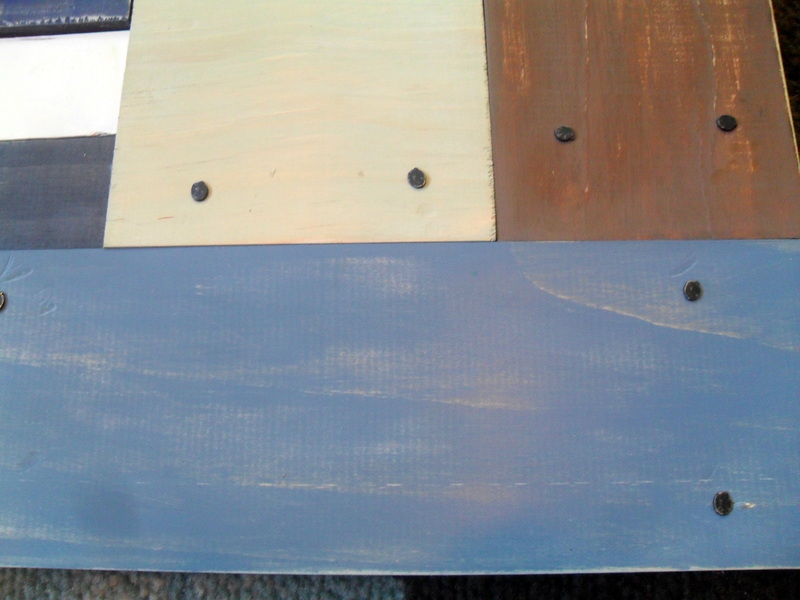 I bought a 2x 4 foot piece of plywood, a few extra pieces of wood, a couple of sample size paint jars, and some tacks. It only cost around $40.00! Everything else I had… a lot of wood pieces, glue and leftover paint. Most of the wood I used is considered “craft” wood. 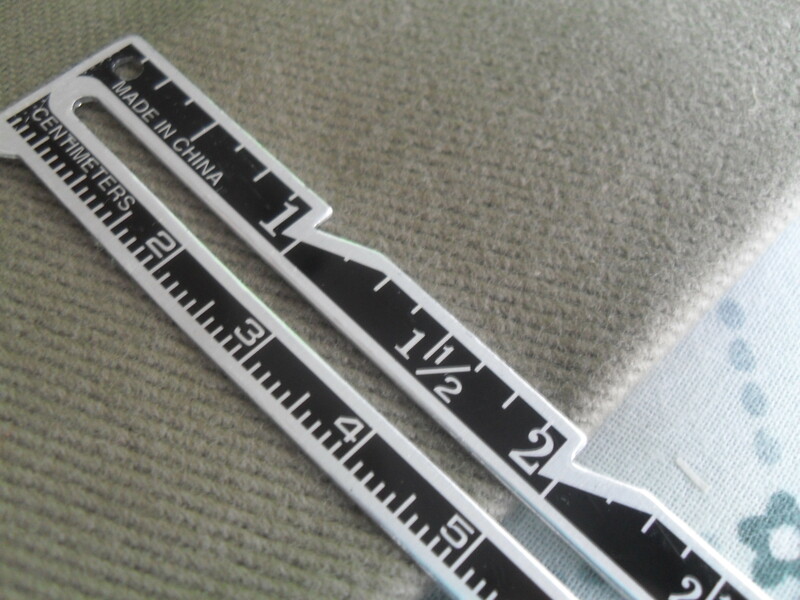 It comes in short lengths and is thinner than regular wood. I did combine it with “regular” wood though. It gives the piece some dimension. My Pottery Barn Knock-off version. 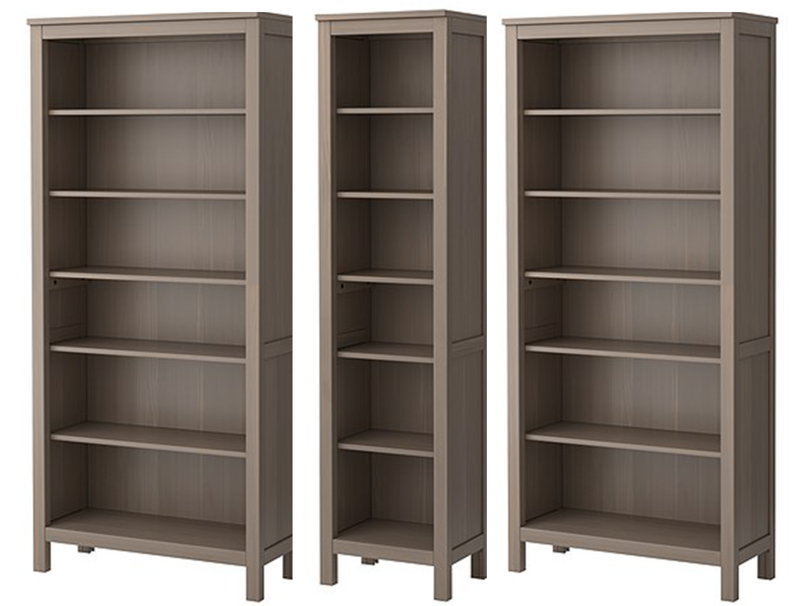 Pottery Barn $399.00. Laurie $40.00! I applied the paint with a cut up old t-shirt. 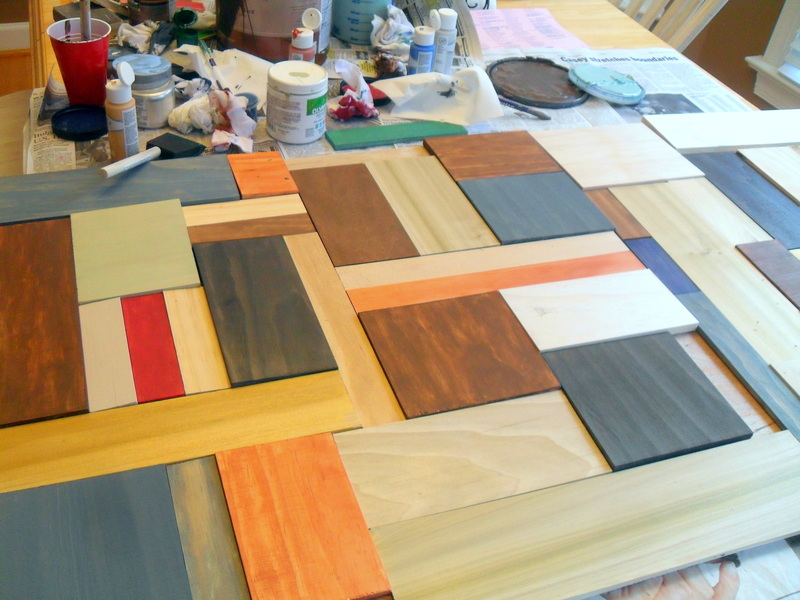 That way I could rub the paint on like a stain allowing the wood grain to show through. 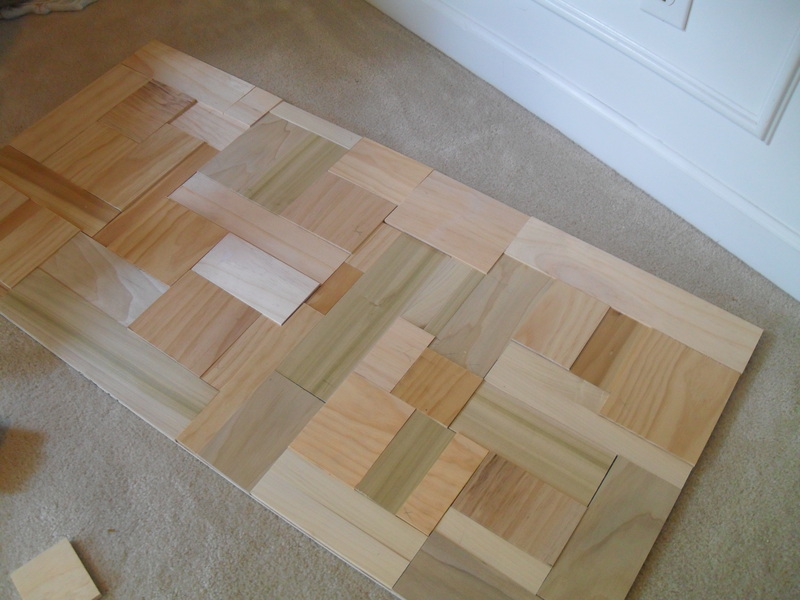 Each piece was glued down to a 2 x 4 sheet of plywood board with Tite Bond Wood Glue. Blue tape is always handy for extra support. The Vodka is for weight, not for drinking. At least not in that moment anyway. 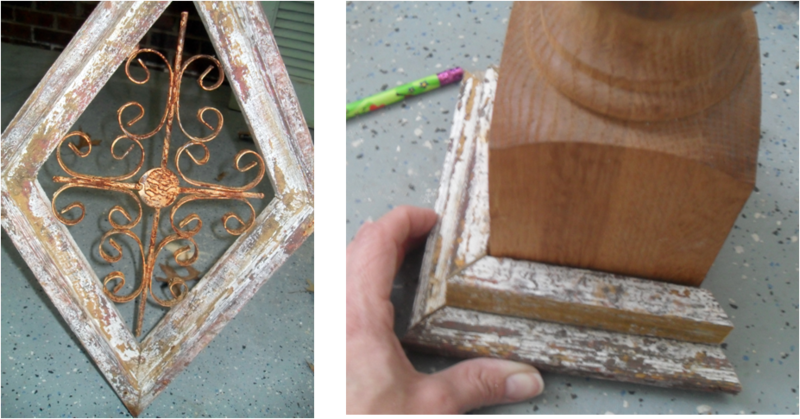 After all the pieces were glued down, I distressed each piece with sand paper to lighten the paint colors and to give it a worn out look. 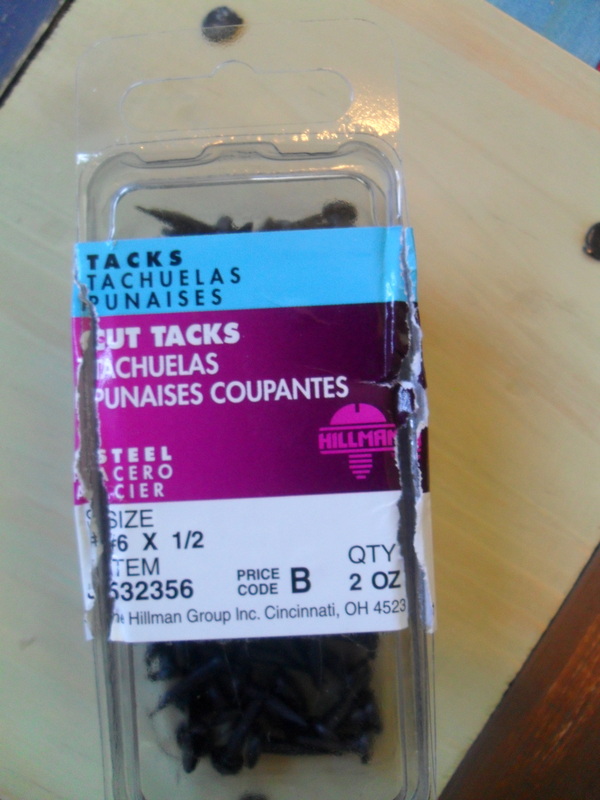 I found these tacks at Lowes. I lightly sanded the tack heads so they looked distress as well. I’m not sure where I’m going to hang it yet. I may add some trim around the edges. This was a FUN project. 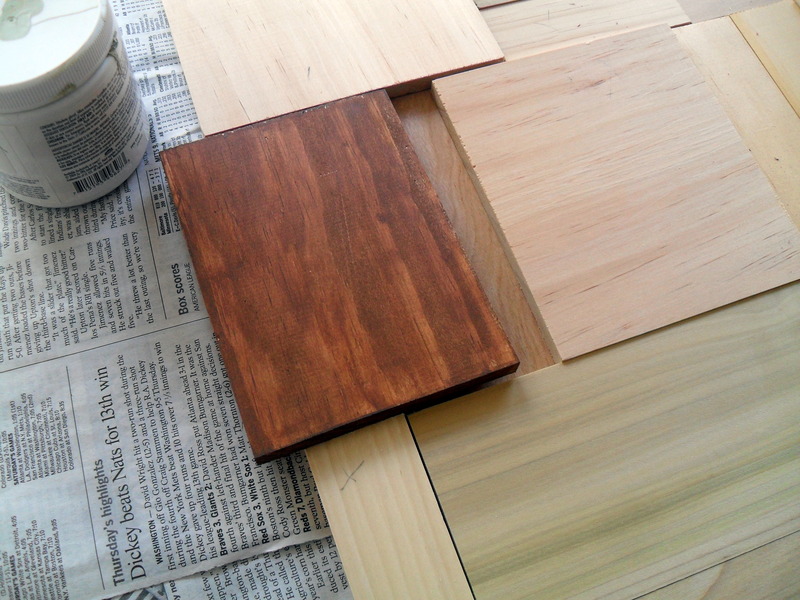 Although I used a power saw to cut the pieces, it can be done with a simple miter box. Posted in DIY (you can do it! 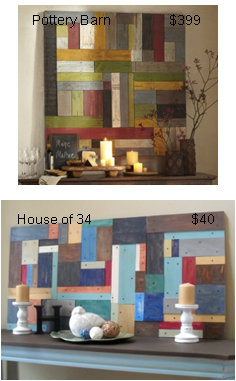 ), DIY Decor and tagged craft, distressed wood, home decor, home decorating, paint, picture, plywood, Pottery Barn, Pottery Barn knock-off, power tools, wall art, Wood. Bookmark the permalink. Inspirations and ideas can come from anywhere, even when you’re not looking for them. I saw this “Architectural Pillar Holder” while flipping through the Pottery Barn catalog. It looked interesting and it got me thinking about all the pieces of wood, extra moulding, trim, and old picture frames I have lying around. What a good way to repurpose some of those “left overs” and make something functional and attractive. And who doesn’t like a Pottery Barn knock off project? 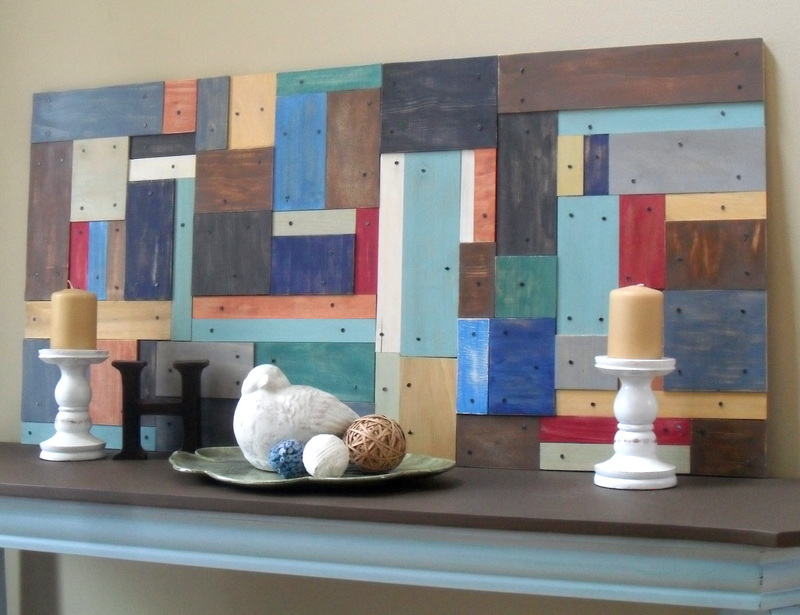 I started with this piece of wood I bought at Habitat Restore a while ago. It was only $1.00, so it had to come home with me. I believe it is a piece used in stair railings, but I don’t know what it’s call. The top was cut off to have a flat surface to set a candle on. I bought this “window” at a junk yard almost two years ago. 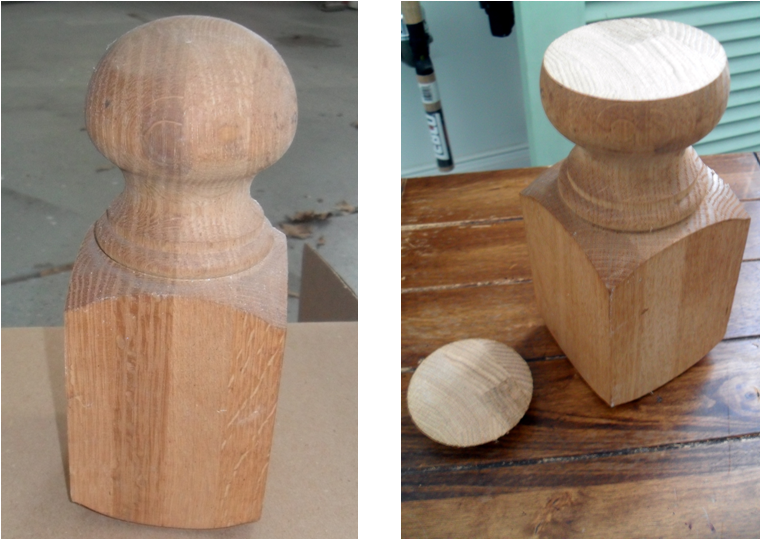 Never found a home for it, so I took it apart and it became the base to my pillar. Miter cutting all these pieces was not the easiest thing for me. It took awhile to wrap my head around which way to lay the wood down on the saw to get the right cut. But I got the hang of it. 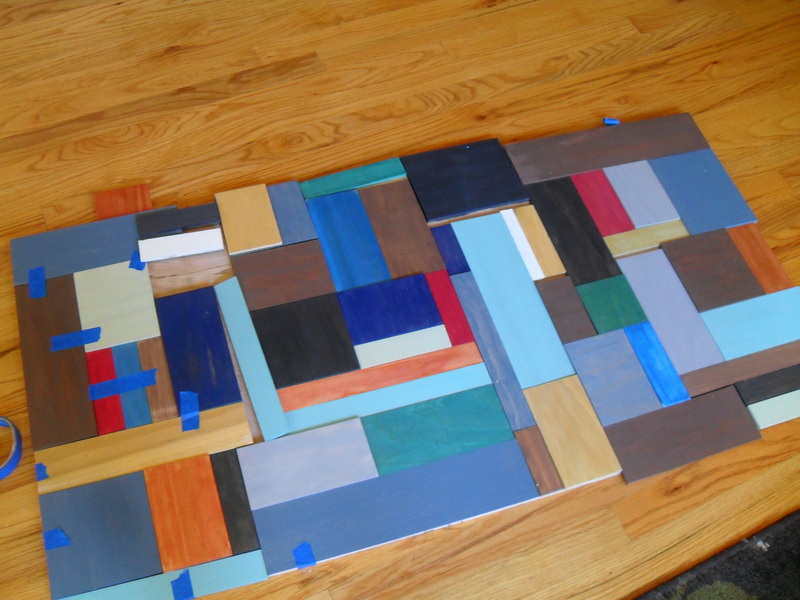 I kept going, making small squares out of frames and moulding and stacked them up on top of each other. 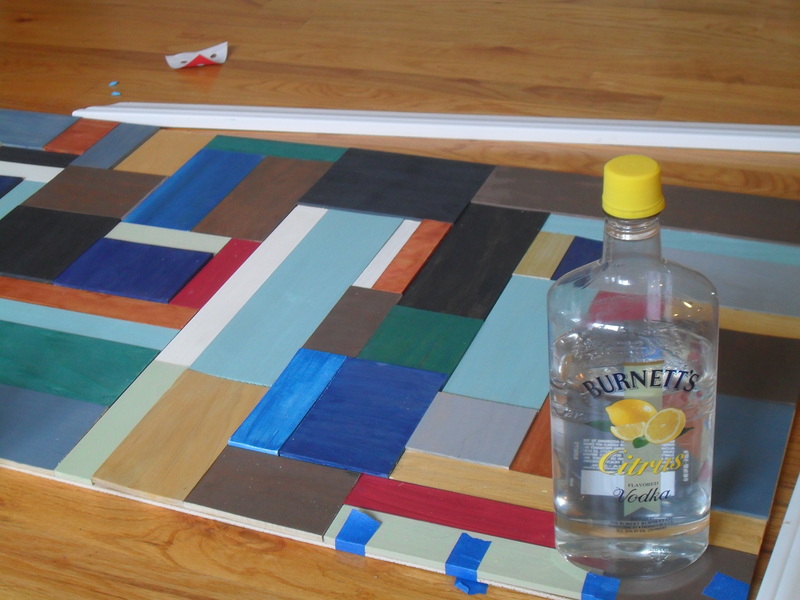 I used Elmer’s Multi-Purpose All Glue, because that’s what I had on hand. (It’s not the “school” Elmer’s glue) If I had wood glue, I would have used that instead. But since I wanted this project to be “free”, I used only what I already had Mr. Elmer worked great. It’s not coming apart. 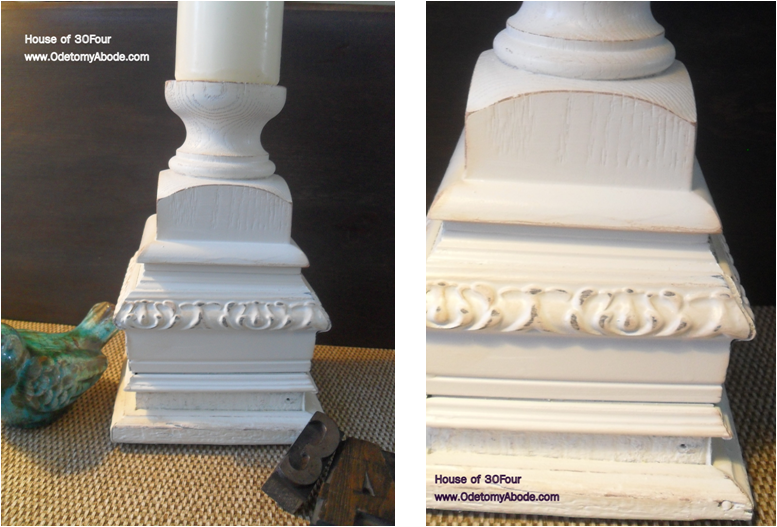 I continued to stack the moulding and trim until I got the look and height I wanted. 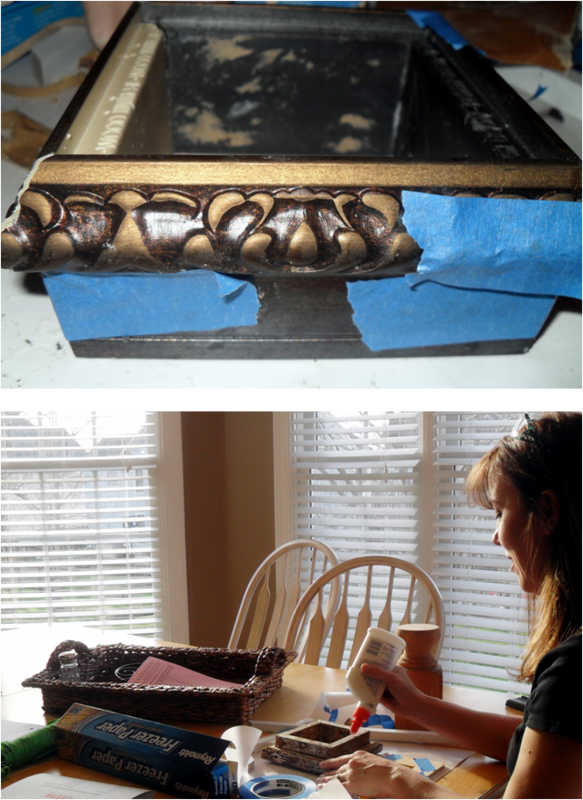 After the glue dried for a couple of hours, I sanded and spackled some of the rough edges. Then the whole thing was spray painted a satin white. (took 3 coats) Once the paint dried, I sanded the edges to distress it a bit then rubbed “distress ink” on the edges to give it that “aged” look. I think it looks pretty cool. 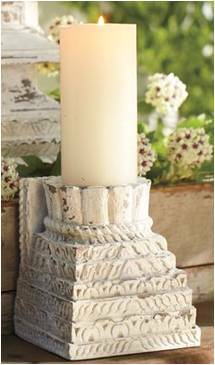 Posted in SOS (tutorials) and tagged Accessories, Candle holder, Candle pillar, crafts, DIY, Home and Garden, knock-off, Pottery Barn. Bookmark the permalink. I love Pottery Barn! But I don’t always love the prices. I was browsing around the store recently and saw these beautiful napkins. They were $6.50 each. Kinda pricey to wipe your hands on (if you ask me), but cheapo for pillows. Inspiration hit! 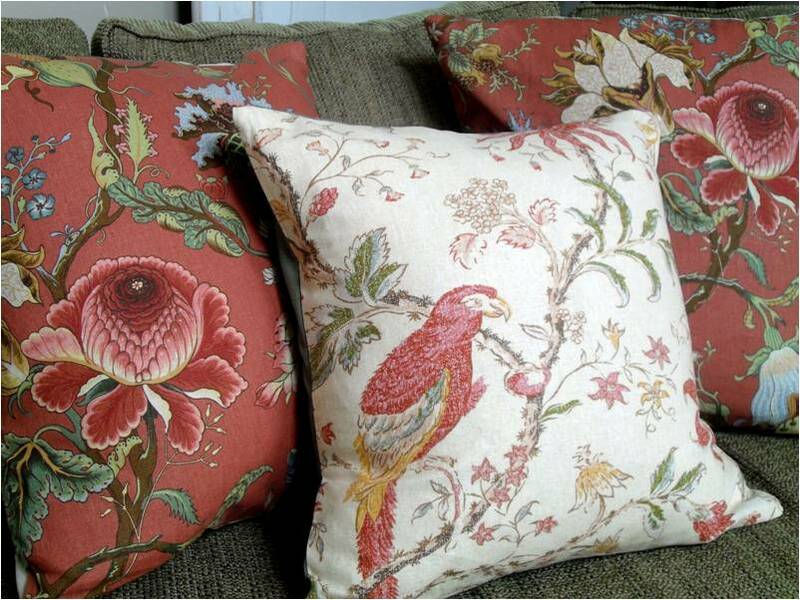 I have been looking for pillows for my sofa but not diggin anything I’ve seen. I picked up four napkins, costing under $30.00. 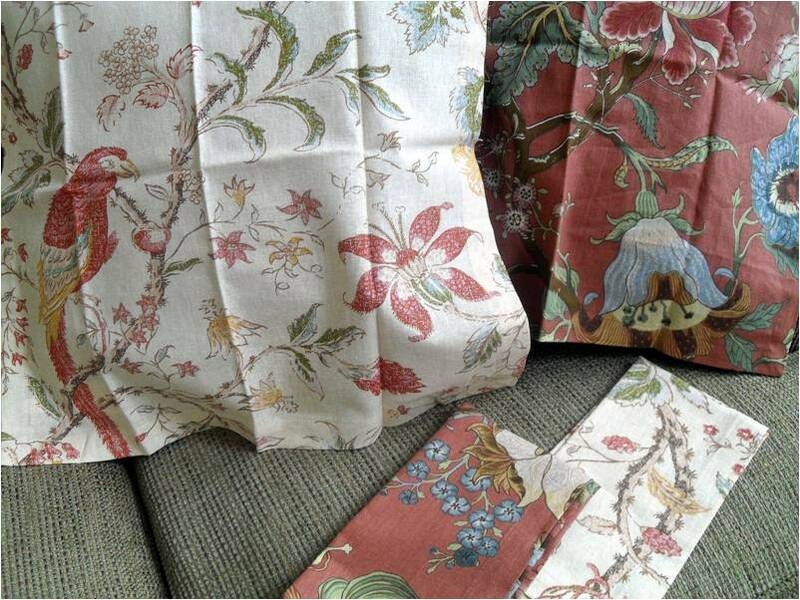 I had plenty of fabric at home to use for the backs, so there was no additional cost. 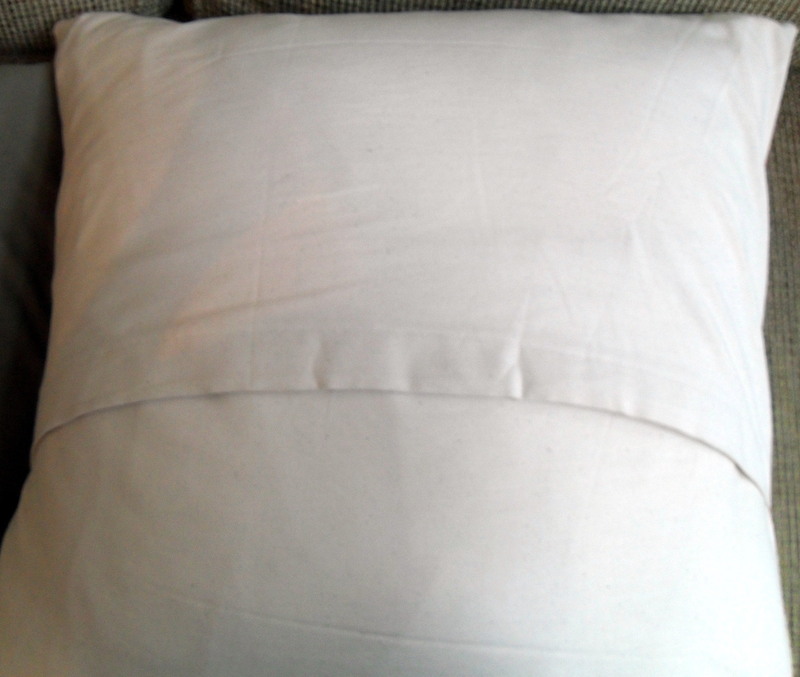 To make the pillows, first iron the napkins. 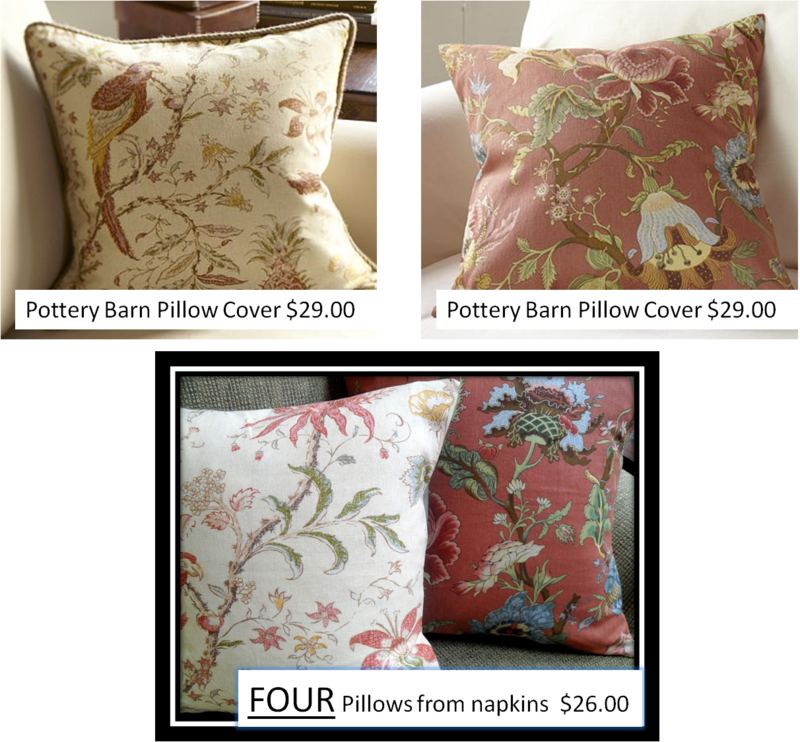 Determine the size pillow cover you want and cut the fabric accordingly, adding 1/2 inch seam allowance all the way around. (I made two 20 inch and two 18 inch pillows.) 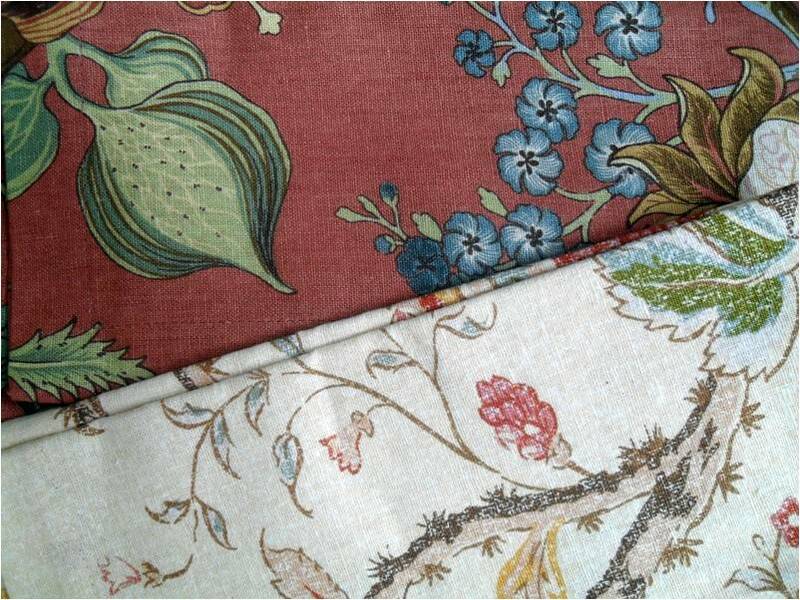 For the envelope style back, cut two pieces of coordinating fabric 1/2 the length of the pillow plus 6 inches. Fold the seam of both back pieces 1 1/2 inches and iron then fold again two inches, iron and sew the edge of the seam. 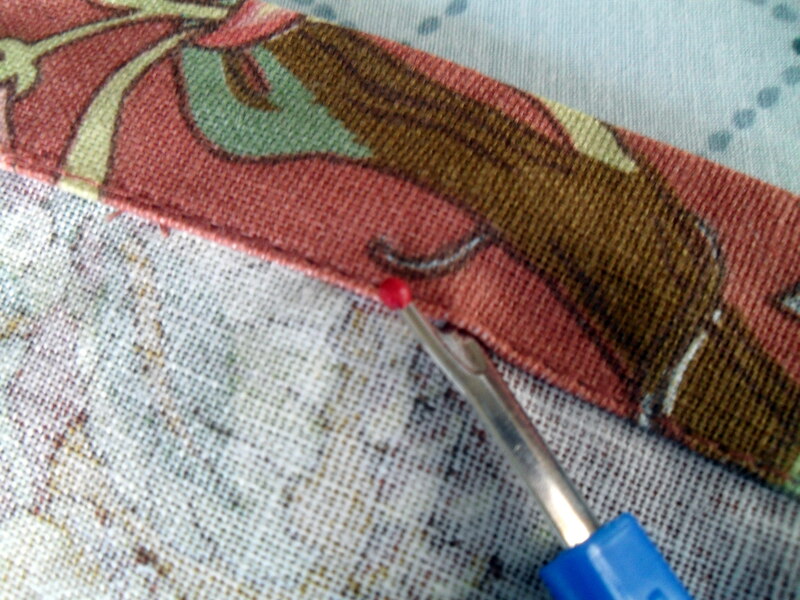 With right sides together, sew 1/2 inch seam on all four sides, turn right side out and iron. Voila! 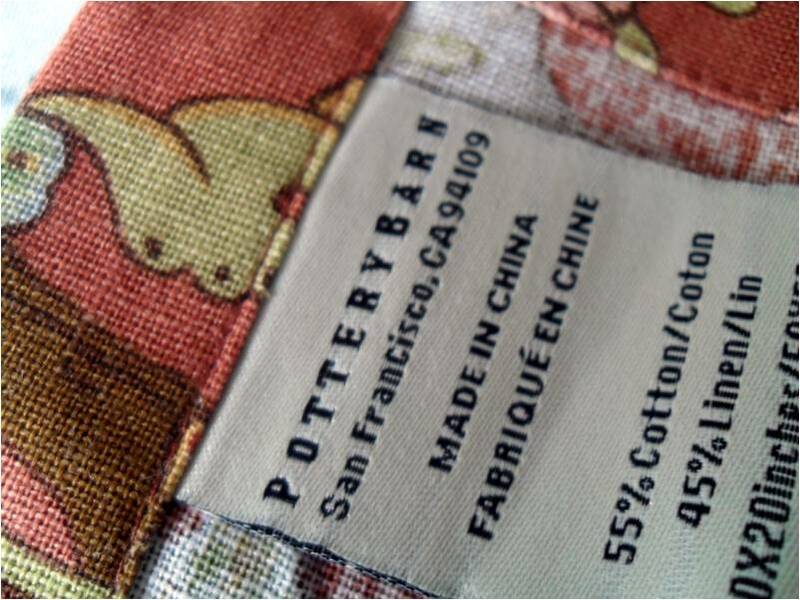 Posted in SOS (tutorials) and tagged handmade, Pillow, Pottery Barn, sew, Sewing. Bookmark the permalink.